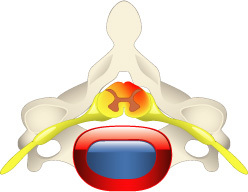 Stenosis is a narrowing of the spinal canal due to the encroachment of disc material or bony growths (pictured above) that squeeze and irritate the spinal cord and/or extending nerve roots. This can lead to pain, numbness, tingling, or weakness in the legs, feet or buttocks. Spinal stenosis is commonly a contributing cause for sciatic symptoms.